Matilde Retana, 72, packs up her belonging after being evicted from the Little Farm trailer Park in El Portal on Sept. 28. Emilio Zangroniz is reading over his eviction paper at the Little Farm trailer park. He said the management won't take late payments forcing him into eviction. Myriam Jules holds a picture of daughter Chayenne. The picture was tossed out with the rest of her family's belongings. They were evicted on Sept. 28. Little Farm tenants protest at El Portal Village Hall. They're asking the coucil to have the land's new owner fove them more time and more money to move out. Hear the residents of the Little Farm trailer park in EL Portal talk about being pushed out. While many of the tenants paid thousands of dollars to purchase the trailers they live in, they all lease the land under them. The battered 15-acre park was sold earlier this year for $14 million to Coral-Gables based Wealthy Delight LLC. The new landowner gave residents a February deadline to move out. The trailers will be razed and a yet-to-be-determined development project will go up. The residents at the mobile park are mostly single moms, elderly or disabled. Many rely on government checks, part-time and odd jobs to barely make it. Legal Services of Miami filed a suit on behalf of the tenants to stop the park's demolition, but a judge dismissed the suit. Now, tenants and their allies, including a vocal state representative, are turning to El Portal Village Hall in the hopes that the mayor and council can pressure the new landowner to give the mobile home residents more time and more money to move out. “They have to make us whole,” said Marie Janine Desir, as she mashed up bananas for her 16-year old disabled daughter, who suffers from seizures. Her daughter is nonverbal and can’t walk. Marie Janine Desir lives in the Little Farm trailer park with her 16-year old disabled daughter. “They can’t just drop us in the streets to live under a bridge somewhere,” said Desir ,who said she paid $10,000 for her three-bedroom trailer. Under Florida law, mobile home tenants are entitled to a relocation fee. For a single wide trailer like Desir’s the state will pay $1, 375. Howard Kuker, an attorney representing Wealthy Delights, said his client will pay double the amount the state offers for tenant who vacate the property by Thursday (Oct. 1). "We’re doing more than the law requires.," said Kuker. "If they have a problem, the problem really isn't with us. The problem is with the law. 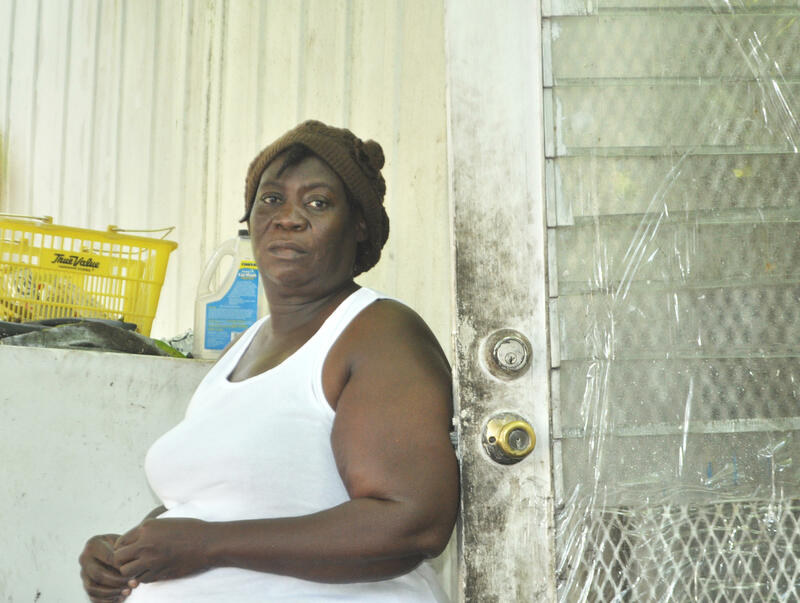 Marleine Bastien, one of the activists mobilizing the residents, said the amount residents are being offered is paltry. “It is expensive to live in Miami,” she said. “After these people are asked to pay first month, last month and a deposit, they won’t have enough. Where do they expect them to live?" Bastien said the deep pocketed developers who purchased the property should be able to compensate the residents more. An eviction notice posted at the Little Farm trailer park in El Portal. Meanwhile, residents are worried about recent evictions. Miami-Dade police officers are a common sight at the trailer park these days posting eviction notices. Some residents say the recent wave of evictions is a way to force residents out before the February deadline. Kuker, the attorney for Wealthy Delights, said that isn't true. He said the only people being evicted are those who have not paid their rent. On Monday, Myriam Jules left her home to drop off her daughter at school. When she returned, her door was boarded up with wood. 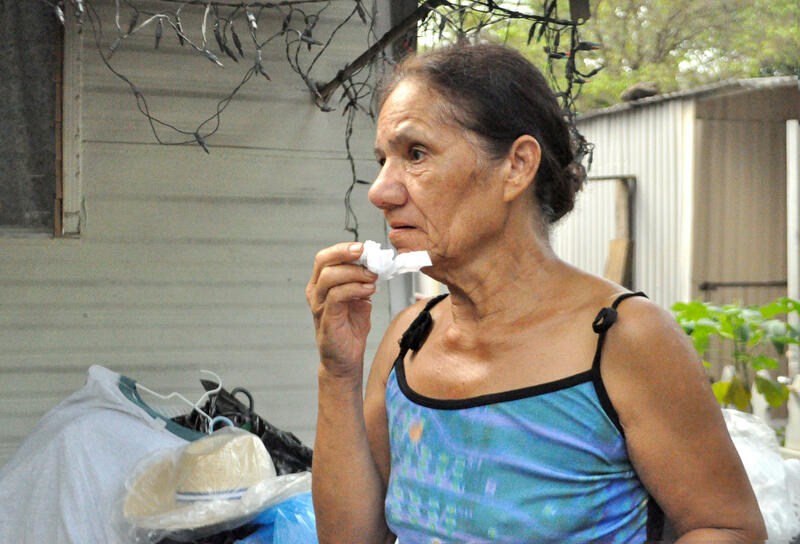 Her family’s belongings were tossed out of their trailer. “I can’t believe this,” she said as she packed up a Disney Princess helmet. She said she was four months behind on her lease payment after losing her cashier job at Walmart. When she went to the lease office to arrange a payment plan, she said they told her they are no longer accepting payments. “They don’t want me to pay because they want the land,” she said. Mathilde Retana takes a break from packing her belongings to wipe her tears. She was evicted from Little Farm trailer park. her life’s possessions on the side of the curb. Mayor Claudia Cubillos and the village council passed a humanitarian ordinance to assist residents who are being evicted on a case-by-case basis. The fund is $6,000. Cubillos said the Village would pay for the women to stay in a motel for a few nights from the emergency fund, but activists say paying for limited motel stays does not get to the heart of the problem—that these families are on the brink of homelessness. Cubillos has told residents that she will urge the developer to extend the February move-out deadline to June. Kuker, the attorney who represents the landowner, said he had not received that request. State Rep. Daphne Campbell has been following the events at the mobile park, showing up when residents call her after being evicted. During an exchange with Cubillos at the mobile home park, she told the mayor, “I want the evictions to H-A-L-T, halt,” adding that Cubillos could stretch her political muscles to force the developer to do right by the mobile home tenants. Campbell said there needs to be a relocation plan for the residents of Little Farm. "These are human beings," she said. "These are people." The Village of El Portal has said that it would help residents find other affordable housing options, and a letter sent to the tenants by the new land owners also stated that housing advisors would be onsite helping people relocate, but residents say that hasn't happened. Emilio Zangroniz said no one has talked to him or his neighbors. "The only option I got is get the hell out," he said. Desir, the longtime tenant with the disabled 16-year old said she’s praying for a miracle. Rental start-up Zumper has released a map (scroll below) of the median rents across Miami neighborhoods, and concludes the Miami rental market has become the sixth most expensive in the country. According to Zumper, the median price of a one-bedroom rental in the city — including apartments, condos, and rentals — $1,880.